Financial Planning for a New Attending Physician. Yep, things just got real! Or as my friend Ron Burgundy said, “Well, that escalated quickly.” It will be June before we know it and thousands of the best young minds in medicine will become attending physicians. 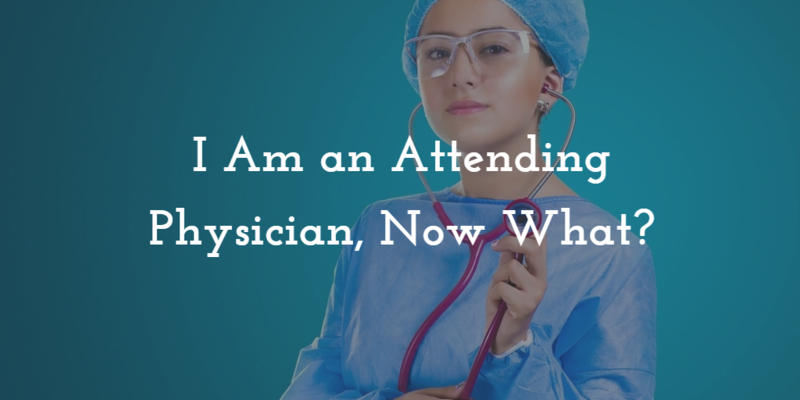 Whether you are finishing up residency or your fellow, the official “attending” title is just a signature away. As my other good friend Forest Gump said, “Life is like a box of chocolates, you never know what you’re gonna get.” That is my favorite part of working with a new physician, the complexity of each plan is so unique to the client. Some physicians come to us with $500,000 in student loans, some are married with two kids, a beautiful home, and almost 7-figures in student debt, and some have no debt but have no idea what to do with these massive paychecks that keep appearing in their bank account bi-weekly. The goal of this blog is to give our newly minted physicians some guidance of what to do with these new very large paychecks by looking at common topics and not so common topics. For many, you probably just went from a $60,000 salary to a $200,000 salary, or maybe much more depending on your specialty. Now what? Many of the basics, Student Loans, Budgeting, Emergency Fund, Home Buying, Insurance, and Investing were in a recent blog of ours, “THE MEDICAL RESIDENT’S FINANCIAL BLUEPRINT.” Some of those topics will be addressed here but in a different context, or we will build upon the idea from our last post. However, I wanted to include some other not so common topics such as IVF and asset protection. Let’s start with the elephant in the room, student loans. I can only hope you had a plan in place since the time you started residency. At this point, you should only have two options on the table. Option 1, assuming you just became an attending and signed a medical contract, you now know if your employer is a 501c3 and you are just a few years away from Public Service Loan Forgiveness (PSLF). Hooray! Trust the process, keep paying your income based repayment amount (remember it will jump up for the last few years with your higher income), and send in your employment certification form each year! Option 2, you were never on a path for PSLF. Now would be a good time to refinance to a lower rate, your debt to income ratio is much more appealing. Continue to live like a resident for the next 2-5 years, and pay your loans back AGGRESSIVELY. Box of chocolates, every situation is different, but if you can commit to a 5-year loan with a lower variable rate, you can get a very low rate and be debt-free in a few short years. Yes, rates should rise over the next few years, but they can’t climb that quickly in a 5-year window. You can do it! Key things to look for: You only have option 1 or option 2, make sure you are fully committed to one or the other by this point. First and foremost, update your disability insurance to incorporate and protect your new increased salary. Hopefully, you had a rider for guaranteed insurability. If so, your insurance carrier will either need to see a medical contract or a tax return showing your new income. If you didn’t have a guaranteed insurability rider, you would need to add a supplemental policy, and consider adding the rider for your future income increases. Now is a good time to check your disability definition. Most young physicians assume all disability is the same because they bought it from the same insurance agent in the hospital cafeteria. All disability is not created equally. You should have a true own-occ policy to protect your specific occupation. Key things to look for: Find an independent insurance agent. If they only work for one company, you only get one option, that is not ideal. I know status quo says work until 67-70, however, keep in mind many physicians don’t work that late and/or go to part-time or can self-insure. I think age 65 is more than enough, and most likely the policy will be stopped even before that. Elimination period = how long can you survive without income. I usually go with at least 180 days if you have a nice emergency fund. Why do I bring up those points? I am shocked by how many young physicians come to us with a benefit period to age 70 and 90 elimination periods. Longer benefit periods (ex: age 70) and shorter elimination period (ex: 90 days) lead to a larger commission to the insurance agent. White Coat Investor does a great job on the specifics in this disability series. Life insurance is also important, but it is difficult to make blanket recommendations. If I had to give one piece of advice, it would be to buy a 20-30 year term for $1,000,000 - $2,000,000. Depending on your health this should be cheap, less than $100/m. Don’t let a salesperson “sell” you a whole life policy. In no way shape or form should your first insurance policy be a permanent insurance product. Things that are more important than investing: student loans organized and on proper payoff path, no bad debt (for most that is credit cards), proper risk management in place (disability coverage from above and some low-cost term life insurance). Why does insurance come before investing? If you can’t earn a paycheck, what does is matter if you “maxed” out your Roth the past few years? The other item to check-off before investing is your emergency fund. I am more aggressive here and like to see 3-6 months of INCOME, not expenses, in an accessible emergency fund. If your employer plan allows “after-tax contributions,” you can save up to a total of $56,000 (2019). The $56,000 includes ALL contributions including your employers. This can also give you a huge Roth IRA opportunity in the future. After-tax and Roth contributions are different, so make sure you ask your HR or plan provider the right questions. If you are able to max out your employer plan each year at $19,000, possibly $56,000, and max out your IRA/Roth IRA each year at $6,000, you should be in pretty good shape from an investing standpoint. Key things to look for: If you don’t have a specific plan in place for your future goals, just save as much as you can. My joke that I overuse is that you are never going to yell at me in retirement and say, “Dang it Chad, I saved too much money and now I don’t know what to do with it!” The more important advice would be don’t forget to enjoy life today as well. This may be a topic you didn’t expect to see here, but this is important for many young physicians because family life seems to get a later start when compared to your peers. You go to college, then medical school, then residency, and then fellow, and before you know it your 30+ years old. You spend a few years getting financially comfortable, and now you're in your mid-to-late 30s and ready to start a family. We have had this topic come up with a few medical professionals and other young professionals, and with financial planning, you always learn something new. It all started after one client paid out of pocket for a successful IVF, and today they have a beautiful little boy (with the world’s cutest chubby cheeks). At our meeting, she asked me if I knew about the states that covered IVF, and I told her I was not aware. I am an avid researcher/reader, therefore when I am hit with a new topic my brain needs to know more so, I hit the books (aka Google). Did you know that there are 15 states today that mandate IVF coverage? Each of the 15 have their own rules, but many families didn’t even know this type of coverage existed. I won’t get into the details. However, I wanted to at least make you aware of this benefit. Key things to look for: Make sure you read your state’s specific rules. Ask your employer/HR about the program and get all the details. Unfortunately, in today’s world when people get hurt they sue for a lot more than just their medical bills, and multi-million-dollar lawsuits are commonplace. This is even more common for physicians; you have the target on you. When they know you’re a doctor, they commonly add the soccer flop (YouTube’s Worst Soccer Flops) to any injury. Asset protection is tough to give blanket recommendations since each state has its own unique rules. However, I want to review a few good practices. Umbrella Protection- This is probably the easiest way to add liability coverage for you personally. Remember, this does not cover you in the workplace, that is what malpractice insurance is protecting. This is to protect you in a car accident and/or if someone gets hurt on your property. Also, this is vital if you have children and they have play dates at your house. You know there is always that one parent who would sue you if their kid got hurt at your place because “you’re the richest person ever as a doctor.” I always like to insure your net worth, some say more, some say less, but I think that is an excellent starting point for those without a specific asset protection plan in place. Joint Protection- This is a general statement for your home deed, your bank accounts, non-qualified investment accounts, etc. The two most common forms of joint ownership are “Joint with Right of Survivorship” and “Joint Tenancy by the Entirety.” The later, TBE, is only available to married couples and not every state will recognize it. The protection comes from you, as the physician, not owning the asset by yourself. By adding the joint owner, you are adding an extra layer of protection in laymen terms. LLC “It”- “It” refers to any risky assets. The most common we come across is rental properties. You should not own any rental properties in your own name. Spend a few bucks to separate the rental property from your name by putting them in a limited liability company (LLC). “It” can also refer to any other risky assets including dirt bikes, four-wheelers, snowmobiles, etc. Malpractice- If I asked you these three questions right now could you answer them: What are your current coverage limits? Is your policy occurrence coverage or claims made coverage? Are legal costs included in the limits of liability, or will they be paid in addition to policy limits? If you are part of a larger plan, there is not much you can do to change the answers, but it is essential to know what protection you have in force. Key things to look for: Each state has its own exclusive rules, and those should dictate your asset protection plan. Asset protection is proactive, not reactive. If you walk to the mailbox and find a lawsuit, it is too late. Yes, you can make asset protection a lot more “protective” by bringing trusts into the picture, there is just no way to get that specific in a blog, and for many, you don’t need to get that complicated yet. Whether you are a delegator or a do-it-yourselfer, it would be a great idea to sit down with a financial planner and get a plan in place. You can decide if you want just a one-time opinion and game plan, or if you are looking for someone to build the plan and be there every step of the way for the next few decades. A few small decisions today, as a young physician, can snowball into life-altering decisions/outcomes (both good and bad) down the road. Congratulations on becoming an attending physician, you have certainly earned it! Registered Representative offering securities through Cetera Advisor Networks LLC, member FINRA/SIPC. Cetera is under separate ownership from any other named entity. Advisory Services and Financial Planning offered through Vicus Capital, Inc., a Federally Registered Investment Advisor.